Big Color Blocked Tote - free Sewing Pattern! 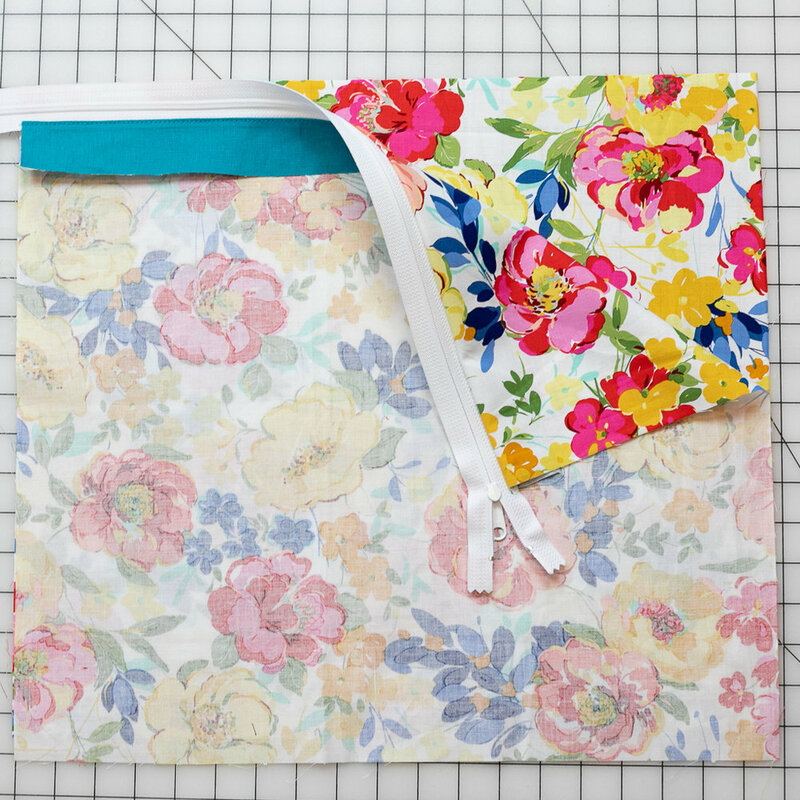 Sew yourself a beautiful new bag - just in time for spring! 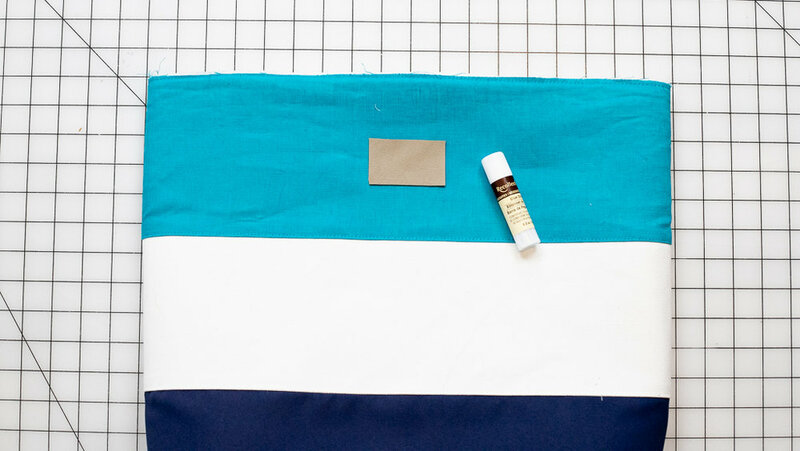 I know you’ve been waiting for it… the Color Blocked Tote Tutorial is finally here. I suggest using 3 different colors of canvas fabric on the outside of this bag, quilting cotton on the inside, and foam stabilizer to help it hold it’s shape. You could use quilting cotton or another lightweight fabric on the exterior too - and in that case I’d recommend fusing some interfacing to it first - such as Pellon SF101. The Color Blocked Tote is large and roomy, with a recessed zipper and easy straps that have rivet embellishments. Want pockets? That’s easy - you can use my Welt Zipper Pocket Tutorial to add a zipper pocket on the inside or outside - or both! I filmed a short video to show you the rivets that I used on this bag and the tools you could use to apply them. Watch it to see! 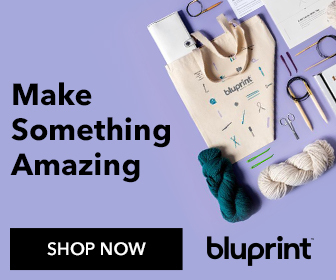 Are you ready to sew a color blocked tote! Let’s do it. 1 handbag zipper, 20’’ or longer Note: I used a handbag zipper - it's wider than a usual nylon zipper with a big pull. A regular nylon zipper would work ok too. Note: It’s fine to use a lightweight fabric for the bag exterior (instead of canvas) - just fuse interfacing to the back of the fabric pieces before moving on. You might notice that the teal fabric I’m using isn’t canvas - it’s linen. I couldn’t find canvas in a color that I liked so I fused Pellon SF101 to the back of my linen pieces to make them approximately the same weight as the canvas. 1. 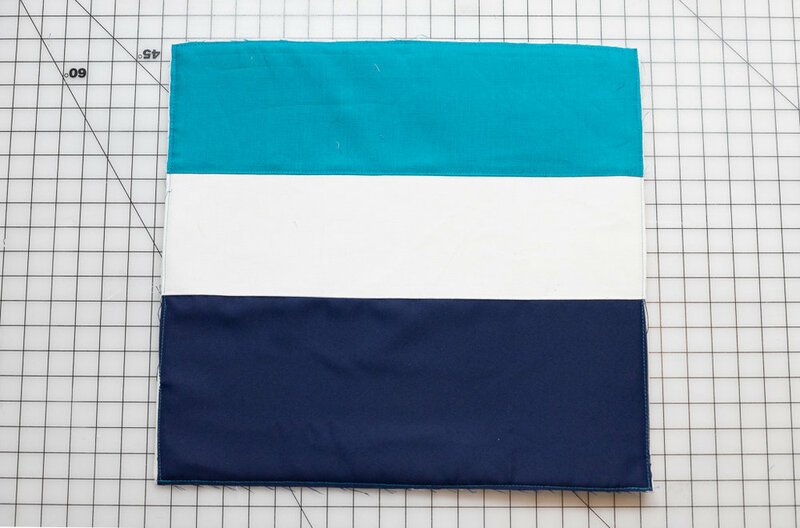 For each of the bag sides, sew a teal, white, and navy fabric rectangle together with the white rectangle in the middle. Use a 1/4’’ seam allowance. Press the seams up and topstitch each seam. 2. Place each bag side piece on top of a 19’’ square of foam stabilizer. Baste the fabric to the stabilizer all the way around 1/4’’ from the edge. Set the exterior pieces aside for now. 3. Mark and cut 2’’ squares from the bottom corners of the bag exterior pieces. 1. 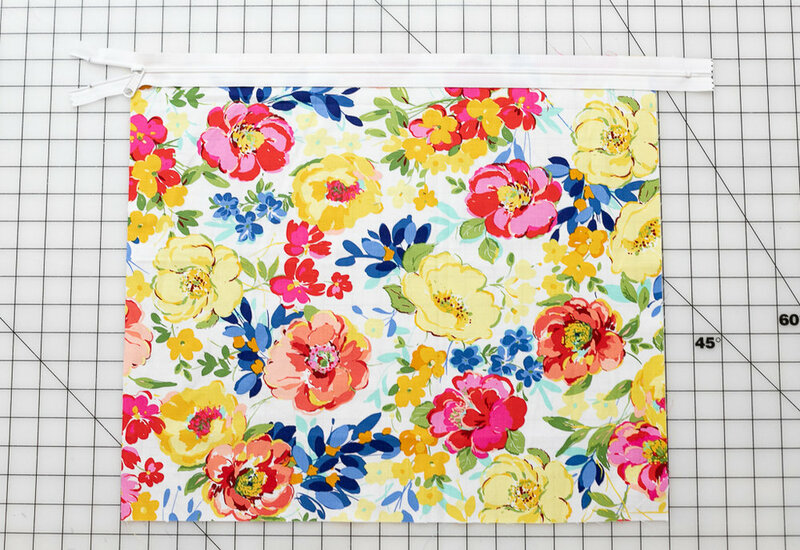 Lay a 16 1/2’’ x 19’’ bag lining piece on your work space right side up. Lay the zipper along the top edge - also right side up. Place one of the 2’’ x 19’’ teal strips (for the inset zipper) on top, right side down. Pin or clip in place. 2. Stitch along the top edge with a 1/4’’ seam allowance. Use a zipper foot if necessary. I was using a wide handbag zipper and a 1/4’’ foot - so a zipper foot wasn’t necessary. 3. Carefully press the inset zipper strip away from the zipper. Topstitch along the edge. 4. Place the remaining lining piece right side up on your work space. Place the sewn lining piece right side down against it, with the unsewn zipper tape along the top edge. Once again, the zipper should be face up. Fold back the first inset zipper strip so it is out of the way. Place the second inset zipper strip on top - right side down. Pin or clip in place. 5. Sew along the top edge with a 1/4’’ seam allowance. 6. Carefully press the inset zipper strip away from the zipper. Topstitch along the edge. 1. Pin the bag exterior pieces and interior piece right sides together. 2. 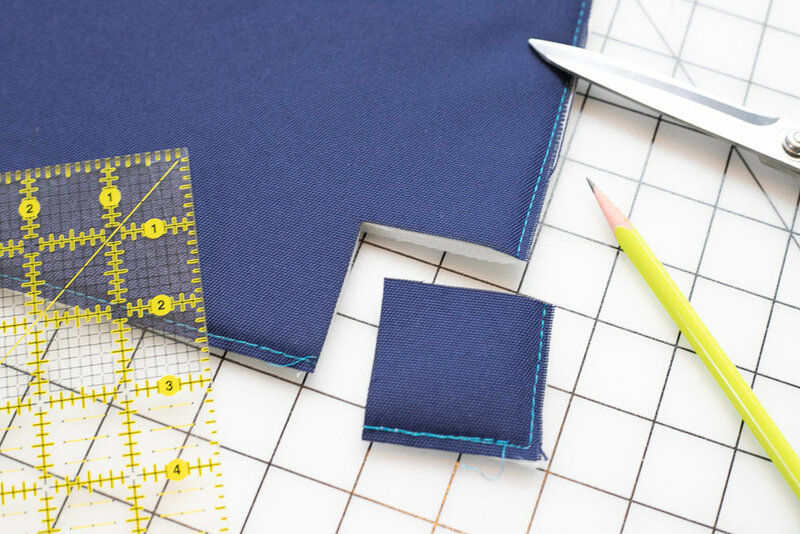 Sew around the sides and bottom of the exterior with a 1/2’’ seam allowance. 3. 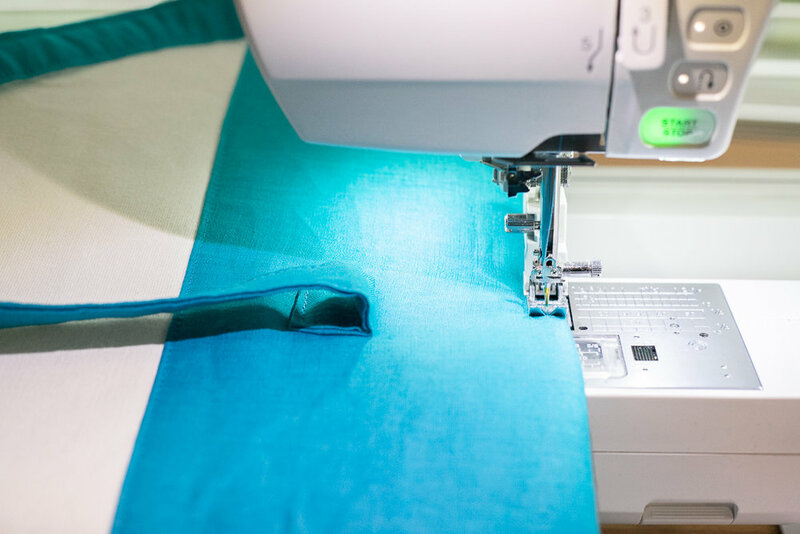 Sew around the sides and bottom of the lining with a 1/2’’ seam allowance - leave a 6’’ opening at the bottom of the lining for turning the bag right side out later. Press all of the seams open. 4. Trim away the excess zipper tapes in the lining seams, if needed. 4. Flatten each side seam against the bottom seam to make a boxed corner. Pin. 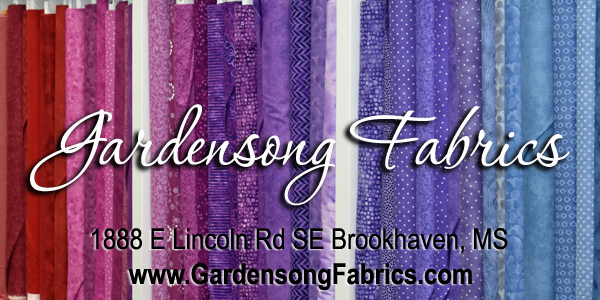 Stitch across with a 1/2’’ seam allowance. 1. 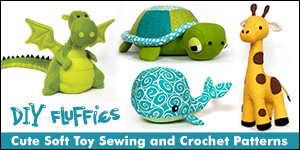 If you want to add a label for embellishment, center the 2’’ x 3’’ leather scrap on the teal fabric. Adhere in place with a glue stick and then topstitch around it. 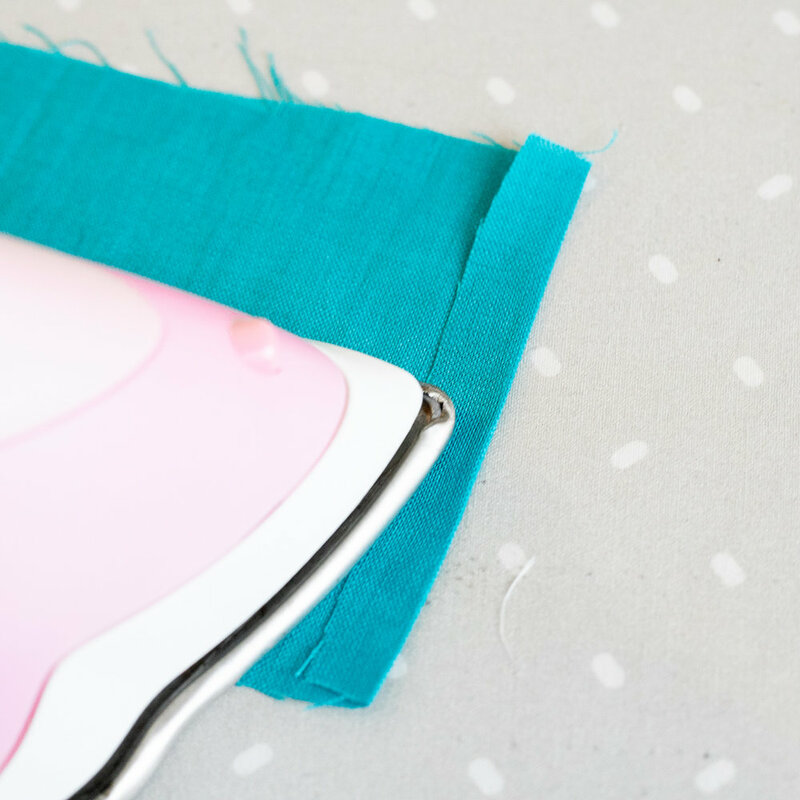 Tip: you could also add the label before sewing the sides together. I wasn’t sure if I wanted it - so I waited until this step to sew it on. 2. To make the handle straps, fold and press the ends of the 4’’ x 29’’ strips to the wrong side by 1/2’’. Fold each strip in half lengthwise and press. Then fold the raw edges to the center and press. Open the raw edges on one side and insert a 1’’ x 28’’ strip of quilt batting or foam stabilizer to give the strap body. 3. Refold the strap to make a 1’’ x 28’’ piece. Pin or clip all of the edges. Repeat for the second strap. 4. Topstitch all the way around each strap, 1/8’’ from the edge. Using a walking foot will help keep your strap straight and even. 6. Topstitch a 1’’ square at the bottom of each strap to secure the strap. Sew around a second time to make the strap extra secure, if desired. 7. Open the zipper in the lining all the way. With the bag right side out and the lining inside out, place the lining over the bag so that right sides are together. Pin or clip around the top edge. 8. Sew around the top edge with a 1/2’’ seam allowance. 9. Turn the bag right side out through the opening in the lining. Carefully press the top edge of the bag. Press the raw edges in the opening of the lining to the inside. Hand or machine sew the opening in the lining closed. 10. Topstitch around the top of the bag, 1/4’’ from the edge. 11. Attach the rivets to the bag handles using the manufacturer’s instructions. See the video I made about the rivets that I used. It is located in this blog post (scroll up) or on YouTube here. I can’t wait to see all the Color Blocked Totes that everyone makes. Please tag me on Instagram @sewcanshe so I can oooh and ahhh at yours!